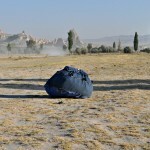 « Day 536 In Beijing: Hot Air Balloon Ride Over Cappadocia, Deflating the Balloon. 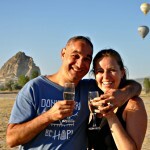 Day 537 In Beijing: Hot Air Balloon Ride Over Cappadocia, Champagne Dreams and Caviar Wishes! Jill’s expression seems to say, “WHAT did I just agree to? ? Jill, the rest of us, and I all got out of the balloon after they deflated it enough to be safe. Butterfly Balloons had set up a table, with champagne on it, and a cake for another person who was celebrating their birthday that day. Captain Mike led us in a round of singing Happy Birthday to the birthday baby and then wished Jill and me a wonderful life together and good luck on our future. It was a perfect way to end the trip. Abby and Brent took a few more pictures of us and we talked about what a magical trip it had been and everyone came over and congratulated us on our engagement. There were people from all over the world, in our little balloon, and it was wonderful to have so many people come together to revel in the joy that we were experiencing. As the balloon deflated completely, they put it in a bag and loaded it onto the trailer. We all got into our van and headed back to our hotels. 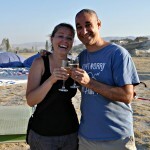 Little did we know, we’d run into Abby and Brent in Pamukkale, later that week. 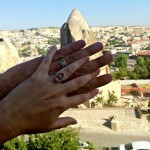 Just another wonderful surprise to our trip that I’ll be blogging about soon! 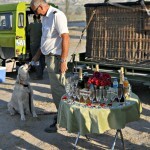 Captain Mad Mike giving Maggie some well deserved water. 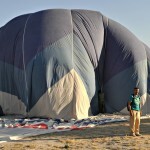 The balloon as it deflates. Our first kiss after descending from the heavens. 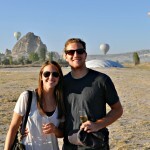 Abby and Brent cheering their own adventure! The balloon is all wrapped up and ready for transport. Back at our hotel and celebrating our engagement.